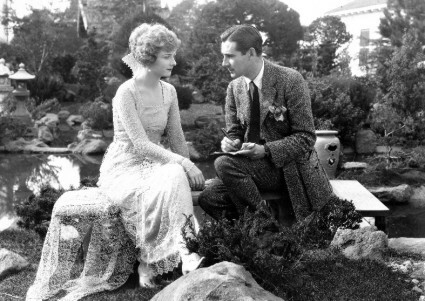 Rex Ingram (1893-1950) was the most romantic of film directors. Certainly he was one of the few directors who looked as though their rightful place was in front of the camera rather than behind it (he began his film career as an actor). One of the great imaginative Hollywood filmmakers of the early 1920s, he is also viewed as one of the leading figures in the diasporic Irish cinema, and James Joyce helped immortalise him by referring to Ingram in Finnegans Wake as ‘Rex Ingram, pageant master’ (the full sentence is a long and frankly incomprehensible one, but the paranthetical reference says ‘his scaffold is there set up, as to edify, by Rex Ingram, pageant-master’). It is certainly appropriate that a new website dedicated to Ingram should have a .ie ending rather than .com, even if he was your typical Irishman in exile (he left the country aged 18 and never returned). Rex Ingram has been created by Ruth Barton, a lecturer in Film Studies at Trinity College Dublin, and it’s good to see an academic produce a site which can be seen as much as a fan site as a scholarly resource. It gets the balance just right. The site introduces him as the ‘handsome, strong-willed visionary was responsible for a succession of films for Metro Pictures, later M-G-M, that topped the box office and were hailed as masterpieces by the critics’, director of The Four Horsemen of the Apocalyse (1921), the man who made stars of Rudolph Valentino and Ramon Novarro, husband of the actress Alice Terry who appeared in most of his films, a man with a bohemian social life, and a perhaps not unwilling victim of the arrival of the talkies. A biographical section is fullest part of this work-in progress site, and covers Ingram’s early life in Ireland (he left in 1911), his time as an actor with Edison (as Rex Hitchcock, his birth name) then as an increasingly admired scriptwriter, to his directing career which began in 1914, first with Universal and then Metro, where his great film included Hearts are Trumps (1921), The Four Horsemen of the Apocalypse (1921), Where the Pavement Ends (1923), The Prisoner of Zenda (1922) and Scaramouche (1923). Ingram rebelled against the strictures being introduced by Louis B. Mayer at what was now M-G-M and decamped to the South of France where he made Mare Nostrum (1926) and The Magician (1926). His style became increasingly personalised and undisciplined, he split from M-G-M, and then the arrival of sound flummoxed him and he retired from the motion picture industry after Baroud (1932). The site also covers Ingram’s parallel experiences as a sculptor, artist, art collector and writer (he produced two novels), and his artistic legacy, inspiring David Lean and mentoring the young Michael Powell at his Riviera film studios. There is a picture gallery and a resources page, though with just the one link to an article and mention of Liam O’Leary’s biography of Ingram, it’s clear that this site is going to develop much further. It’s odd that there is no filmography – it would certainly help to make the site all the more definitive. Rex Ingram is but one output of a project led by Barton to build upon Liam O’Leary’s research, with a hoped-for cataloguing of the O’Leary papers at the National Library of Ireland, an exhibition and film retrospective, and then maybe a new biography. Anyone who can help with the research, partiularly anyone with resources which might be added to the site should get in touch with Barton.